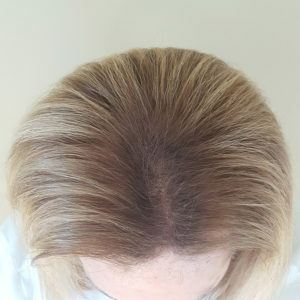 Other types of hair loss including Alopecia totalis (characterized by complete hair loss), Androgenetic Alopecia and Telogen Effluvium (characterized by losing handfuls of hair at a time) are not common and that is why I am only focusing on FPHL as this is the condition that affects many baby boomer women. 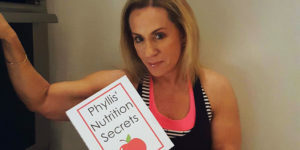 CAUSES: Thinning hair and hair loss in women can happen for a variety of reasons including age, vitamin deficiency, hormones, and certain medications. It can be associated with more complex health issues but this is rarely the case. The most common reason for hair loss in women over fifty is menopause. When hormone levels decrease in the body, hair growth will decrease as a result. Other conditions such as thyroid disease, diabetes, or polycystic ovary syndrome (PCOS) are also among the many underlying illnesses that can cause hair loss in women. Stress, trauma, and poor nutrition are other factors to consider. TREATMENTS: There are different types of treatment available for female hair loss and thinning. The most common and only OTC medication approved by the FDA for FPHL is Minoxidil. This is used in popular brand names like Rogaine and is a topical treatment that aids in slowing down hair loss and possibly inducing hair growth. There are formulas tailored just for women and usually produce a change after a year of use. It’s a long commitment but it does help your body grow hair again. It won’t, however, cure the condition entirely and the results vary drastically. Propecia, available through a physician, is the FDA approved pill most commonly prescribed for men’s hair loss which does work for some women. Other prescription drugs like Aldactone and Tagamet are sometimes prescribed with varying results. If you are interested in trying one of these you must consult with your doctor. Hair transplantation is a popular hair loss treatment for men, but not for women. Only a small percentage of women have the type of hair loss that would make them a good candidate for this procedure and that’s why few pursue this avenue. However, recent advances in hair transplantation make it a viable option for some women over fifty who are experiencing hair loss. A more holistic approach to hair growth is the consumption of certain vitamins such as vitamins B-12, niacin, and biotin and products that contain a blending of various vitamins such as Viviscal. Foods rich in these vitamins like fish, low-fat fortified milk, whole grains, cauliflower, carrots, dark-leafy greens, chicken, eggs, and avocados can be added to the diet. Of course you never want to over ingest these foods, but adding a little bit into your diet daily may also help with hair loss. 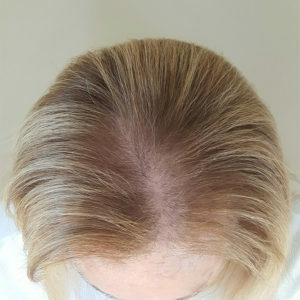 Some other drug-free treatments for hair loss and hair thinning are laser caps and combs. 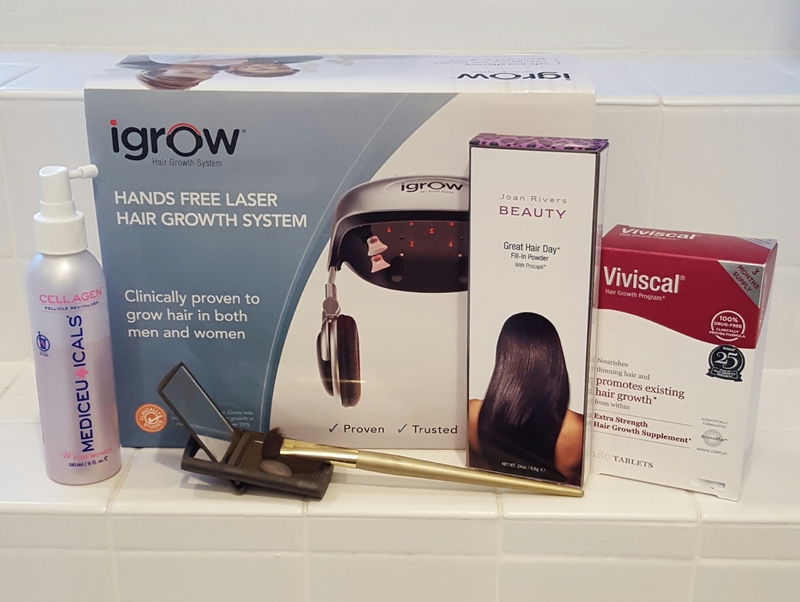 One brand, called igrow, is a laser cap that is FDA cleared for both men and women and uses low-level light therapy to naturally grow thicker and stronger hair. 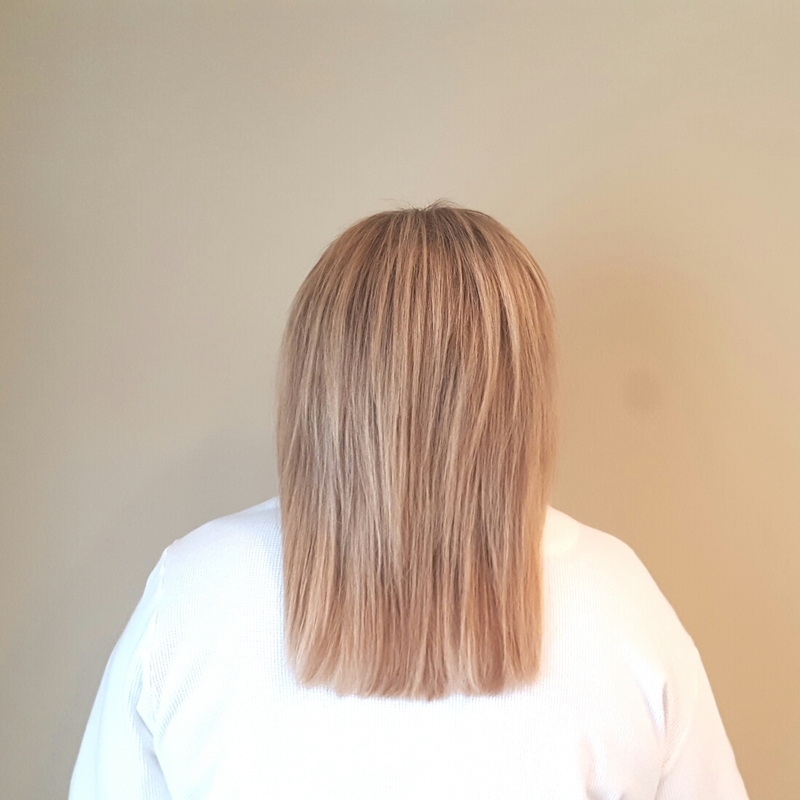 HairMax makes laser combs that stimulate hair growth and reverse the thinning process by activating hair follicles and rejuvenating aging hair. I use my laser cap every other day while I’m drinking my morning coffee. STYLING: If you suffer from hair loss/hair thinning, the way you style your hair can make all the difference. Whether it’s a cut or style, you’re bound to find something that works for you. Keeping your hair at a medium length is best for your thinning hair so it weighs less and won’t look as flat on top. Also try to let hair air-dry after showers. When using heated styling appliances like blow dryers and flat irons, use the lowest heat setting. Velcro rollers are also great at adding volume without damaging the hair. Coloring your hair when it’s thin can be tricky. Over processing your hair can dry it out and make your hair even thinner. Try using a combination of high and low lights to create the illusion of texture without doing all the damage. Semi-permanent colors are also said to be good for thin hair as they are not as harsh as other dyes. Adding some volumizing product to your hair each day will give the appearance of big, healthy hair. AFTER: With powder applied to my roots. Another great way to cover up thinning spots is with concealing sprays and powders. There are many products that are great for simple “on the go” fixes. Most of these products come in a variety of colors so it’s easy to match your hair color. After trial and error my ultimate favorite is Joan Rivers Beauty Great Hair Day Fill-In Powder. It’s easy to apply, does an excellent job at camouflaging thin areas and as an added bonus is great for your brows! I started to lose my hair in my mid thirties after the birth of my first child. My hair was naturally very thick so I was not at all concerned with my hair loss but my stylist was. She suggested all kinds of proactive moves but I ignored her as I didn’t think my minor hair loss was of any concern. After giving birth to my second child at the age of forty one my hair loss accelerated and I freaked out! I made an appointment with my dermatologist and was prescribed Propecia. I stayed on Propecia for about ten years and even though it didn’t regrow my hair it definitely slowed down the thinning. Propecia also improved the texture of my existing hair which was an added bonus. I decided to stop taking it because I felt my hair situation had stabilized and I preferred not to ingest unnecessary medication. For many years my hair was in a holding pattern and if I was gentle with it everything was fine. I was diligent about conditioning my hair and kept the use of heated styling tools to a minimum. These are the products I use to combat my hair loss. Each item attacks the problem differently and together they make a winning combo for my hair loss! About three years ago I went through an immensely stressful time and my hair loss started again. I was so totally consumed with my situation I put my hair problems on the back burner. However, after my hip replacement two years ago the thinning escalated and I knew I needed to become proactive again. I didn’t want to go back on the Propecia so I researched available options hoping something new was available. 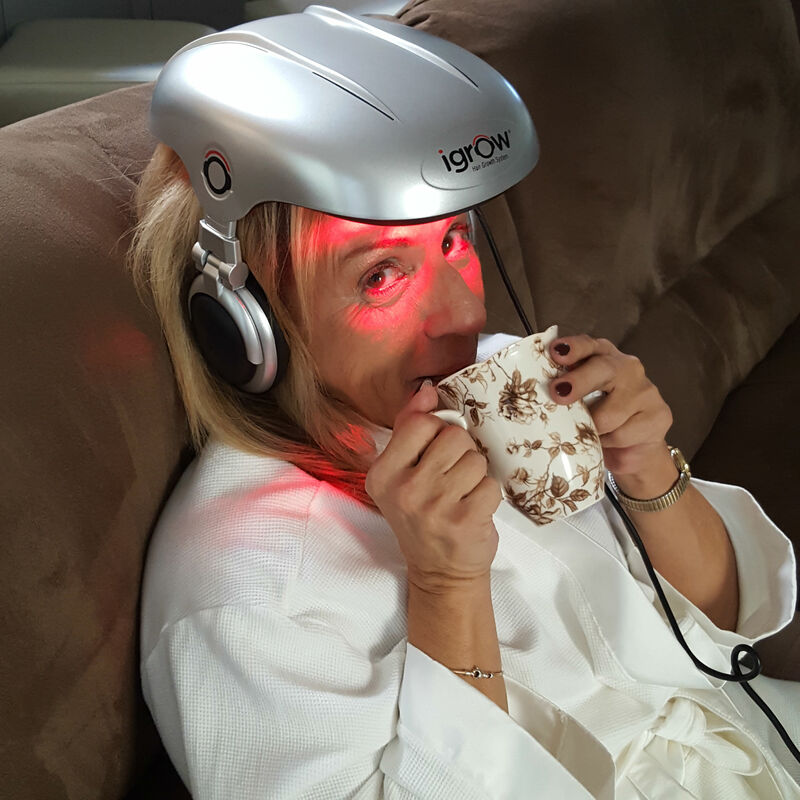 I happened to be watching QVC (I love shop at home channels) when the presentation for the igrow laser cap came on. I had read about laser combs but dismissed them because they seemed laborious since you needed to move them around to treat different sections of your scalp. The igrow is a cap which you put on your head every other day for 20 minutes. I thought why not and purchased it on the spot. I love it!!! It is part of my beauty ritual and I can’t live without it. Recently I got lazy and didn’t use the cap and after about two months my hair loss started again. I immediately resumed using the cap and within six weeks my stylist was amazed at how much new hair I had. The laser cap is just one component to my hair loss strategy. Along with the cap I apply Mediceuticals follicle revitalizer to my scalp daily and take Viviscal. My stylist uses both high and low lights on my hair and I always use my Joan Rivers powder. I am thrilled with my results especially when other people compliment me on my hair. Is it a lot of work? Yes it is but I think it’s worth it. I refuse to be a balding boomer! I hope those of you suffering from hair thinning and hair loss can look to this post for help and support. Having this condition I understand how traumatic losing your hair can be. My advice is find what works best for you. It will be a period of trial and error, but the truth is what works for one woman may not work for another. The take home message here is that although hair loss can be difficult to treat there are options. It’s important to take the time to find what works best for you. New products and treatments are released all the time so stay hopeful ladies! 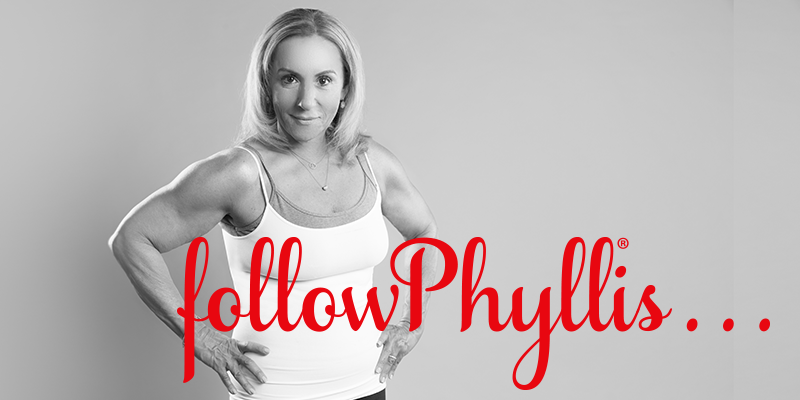 If you love taking care of yourself I know you would enjoy these posts!